I always look forward to the end of October… then the book fair in Antwerp sets up its tents in Antwerp Expo and every year I count the days until I can visit it… a day of strolling through 4 halls of book stands, browsing here, sniffing there (oh yes I sniff my books !! ),… At the end of the day I look at the books I wrote down on my list and then I start buying those that I really want. This has been my routine for more than 25 years now I’ve come to think of it ! There were years I went twice to this book fair… once with my children and once alone… because going with my children meant learning them how to visit a book fair and thus meant too little time to browse myself… so that’s why I needed to go a second time by myself as well! But now my kids are old enough… they know my way and it has now become their way too, and so it has become one of our favourite outings of the year! I love books… and those of you who have recently read my ‘random things about me‘-page, already know who my favorite novel writer is… it is, no doubt, Maeve Binchy! I think I must’ve been about 18 or 19 when I first discovered one of her books. ‘Circle of Friends’ it was, and I was hooked. I enjoyed reading this book over and over again. I fell in love with Binchy’s writing from that very first encounter. I got the book from my local library several times and it was the first second hand novel ever that I bought in England many years ago. Binchy’s writing is so true, so honest. Her characters come to life and you sympathise with them from the start. She writes about real people having real problems in their everyday life. Though that may sound boring, Binchy has the ability to bring life and spice into her books and reading them gives you such a good, warm feeling. What I like about her books is that if you read them in chronological order, you get to know more stuff from characters out of previous books. “Ah, they’re still together”, “Great, their business is booming”, “Fantastic, he’s still on the right path”… This makes you feel part of the community Binchy created and also makes you really addicted to reading Binchy’s books! I have been buying Binchy books over the past 20-25 years. Sadly, in the summer of 2012, Maeve Binchy died (I immediately notified my sister, who was on holiday in beautiful Tuscany at the time, as she is as addicted to Binchy’s books as I am !). When I read Binchy’s last book (or better, what I thought would be her last book), every page I turned made me realise that the magic was nearly over… that there would be no more Binchy books to come. It really made me sad! But Maeve Binchy’s editors and her husband (Gordon Snell) have gathered many short stories Maeve Binchy wrote during her lifetime and made them into a new book. And I just saw on her website that another one is on its way… and then there was this book and this novelle that were still missing in my collection and that I recently bought online… so luckily I still have some more Binchy-reading for the coming months ! Her books are a joy to read from start to finish and I have re-read many of them. As she says in the quote, her heroines do turn into confident ducks as you turn page by page. 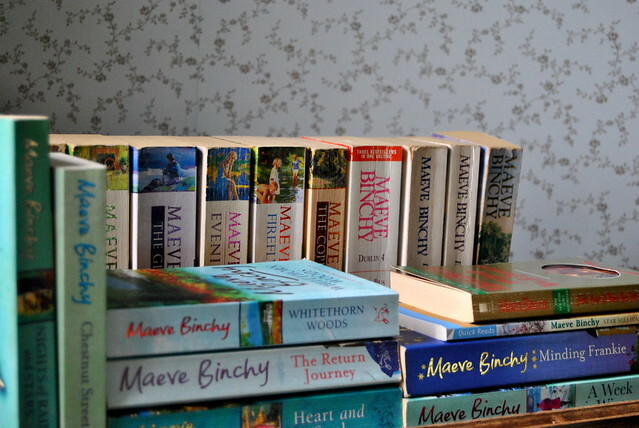 And if I’m really honest with you… something that I would realy really would like to do is start a Maeve Binchy book club… you know… get together with other Maeve Binchy-fans and discuss her books… Perhaps I should put that on my bucket list ! Anyone care to join me ?! It must be quite clear now… I can only recommend you to read her books. But be warned, once started in one… you’re hooked for the rest! This entry was posted in Personal, Quotes 'n thoughts and tagged antwerp, boekenbeurs, book, book fair, maeve binchy, quote, reading.